This year I was so lucky to get to go with my Y6 son on a 3day school trip to the Land of Legends in Lejre, Denmark. 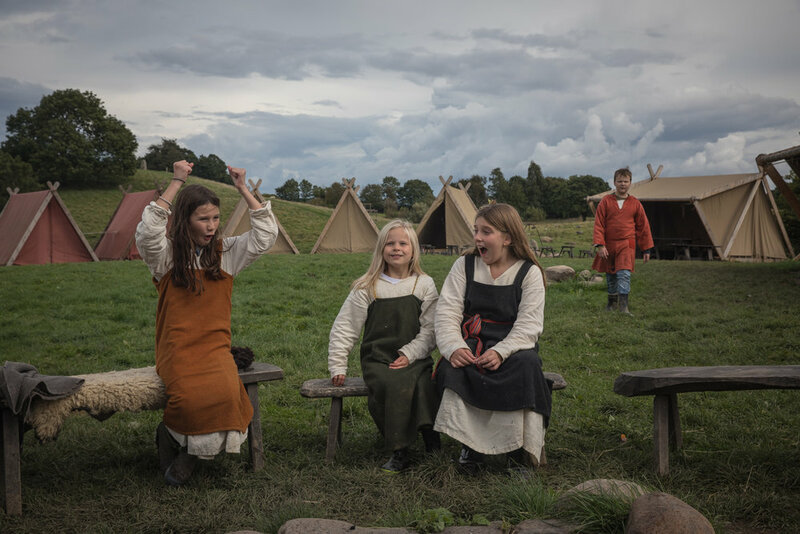 It is a living outdoor museum which shows houses from the stone age and iron age and also some farmhouses from the 19th century. You can have a vacation there where you learn to live like they did back in time. We were going to the viking age. We were not very lucky with the weather. This year the summer in Denmark has been cool and rainy and the first day it rained all day. Nevertheless we ventured out and got lots of tales about how people lived, gender roles and religion. After our breakfast our day started with a tale of the god that the day was named after. On this particular morning we got a story about Thor. Our guides were great! They truly engaged us all. Next was cooking. We actually spent most of our time preparing our meals. We had to make fire, chop wood for fire and keep it going. We made our own butter, cream cheese, breads and stews. Our guides helped us, but they left at 4, so we prepared dinner by ourselves in the viking camp. We smelled SO much of fire as we had to stay in the cooking tent with the fire the first day because of the rain. Food was amazing though and enjoyed by all! Here is our chicken stew. A lot of time also was spent getting cold and hot water for cooking and dishwashing. The kids were awesome though. They all took part in everything and didnt complain about the weather. On our second day we all got properly dressed as Vikings. We learned to make fire with flint, weave and braid and the kids tried the stone age boats. We had sun in between rain. We could sit outside while we cooked and enjoyed ourselves! The first night had been rainy and windy, so this was a treat. The second night was beautiful and we enjoyed a story by the fire before bedtime. That night I found out that there were mice living in the hay beds we slept on. Luckily the kids did not notice. They must have been exhausted from all the work and the rough first night :-). On the last day we learned how to fight and we all had a lot of fun in sunny weather. It was a great trip! If you want to learn more about this place, here is a link to Land of Legends. This blog is part of a 10 on 10 blog circle. You can continue on the 10 on 10 blog circle by clicking this link to Trine Lise Nielsen.